Rebecca, named “Best Waitress 2009” by readers of the Kent Reporter, says that Maggie’s Scramble is one of her customers’ favorite breakfast dishes. 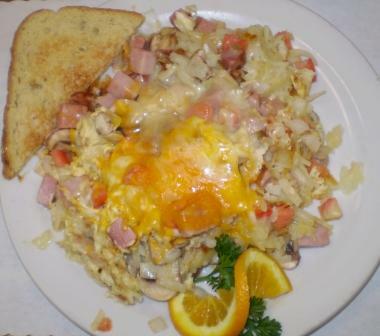 Made with sauted onions, mushrooms, tomatoes and ham, this yummy dish is mixed with scrambled eggs and hash browns and topped with cheese. Served with toast, Maggie’s Scramble is a hearty meal to get you through the morning. The portion is large, so consider sharing or asking for a “to go” box for later. This meal is a bargain at only $8.25. This entry was posted on Thursday, September 10th, 2009 at 3:10 AM and is filed under Uncategorized. Tagged: Best Waitress, Breakfast, kent reporter, maggie's scramble, rebecca. You can feed this entry. You can leave a response, or trackback from your own site. « Don’t Keep Maggie’s a Secret!